Despite living in Provence for over four years now, I never grow tired of exploring and rediscovering the many, authentic and beautiful regions this area has to offer. Inspired by my return visit to the Les Carrières de Lumière last week for the Chagall Opening, I decided it was due time for a new feature on discovering the “Les Alpilles” region. I have since learned there’s quite a lot happening at the moment, from new luxury hotel developments and chic openings within this charming and gorgeous South of France region. One of my favorite places in Les Alpilles is the Provençal town of Saint-Rémy-de-Provence, famous for its light and artistic ties with Vincent Van Gogh. Saint-Rémy is becoming a cosmopolitan destination in its own right, with an array of world-class hotels, restaurants, wine bars and design shops popping up recently. 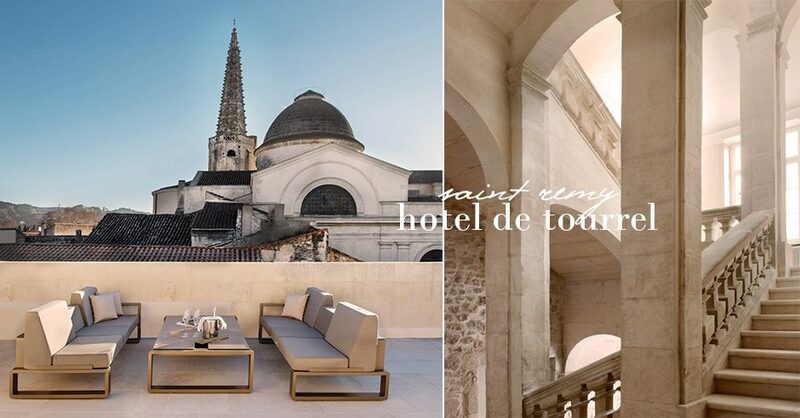 We are particularly excited to learn about the much buzzed about, Hotel de Tourrel. A must-see on our design loving boutique hotel list (learn more below; pictured above). The other must-see city is set within the breathtaking and ruggedly dramatic setting of Les Baux-de-Provence. This stunning, historic heritage site has deservedly been awarded “one of the Most Beautiful Villages in France”. The village itself is crowned with a castle overlooking the picturesque plains to the south, surrounded by olive groves and vineyards on all sides. The defensive capabilities of the natural site of Les Baux have always made it an attractive location for habitation with traces of humans dating back to 6000 BC. Les Baux-de-Provence deserves at least an afternoon visit starting with a stroll through the pedestrian-only old village, a visit to its chateau and culminating with the latest Les Carriere de Lumiere exhibition. The current exhibition dedicated to Marc Chagall, offers a deeper exploration into a solo artist’s body of work for the first-time, as opposed to its usual group shows, which is complimented nicely by a vivid Alice in Wonderland visual adventure, ideal for children. If you’re not a Chagall expert, we recommend spending some time reviewing the artist’s impressive work history in advance to fully appreciate this exhibit. 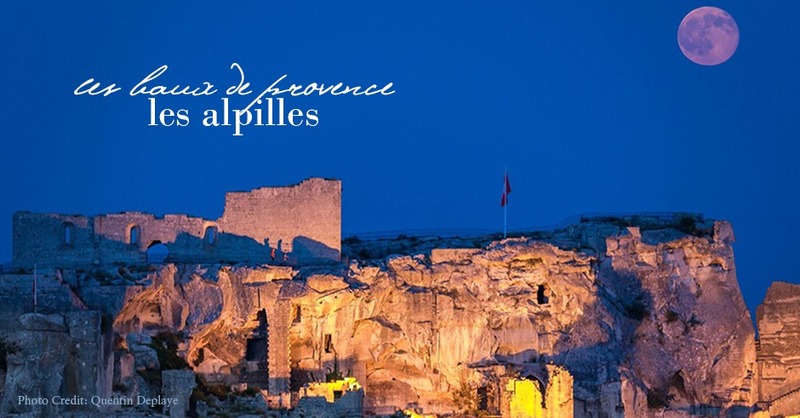 To help us come up with the perfect weekend escape itinerary in the charming Les Alpilles, I asked our luxury travel friends over at Unique Provence to share a few of their expert recommendations with us. We caught up with our dear friend, Laura Jullien, Lead Travel and Event Planner, to share some insider tips on what to see and visit in the area. 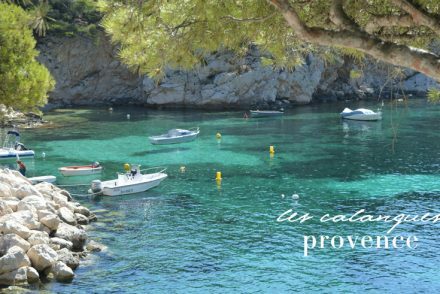 Unique Provence, founded by Philip Haslett and located in Forcalquier, caters to luxury-loving travels who are seeking authentic, haute de gamme tours and unique travel experiences in Provence for international clients. So, here we go. Our Must-see Guide to Les Alpilles with much help from Laura and the team, including the top places to lunch and stay in this gorgeous region. 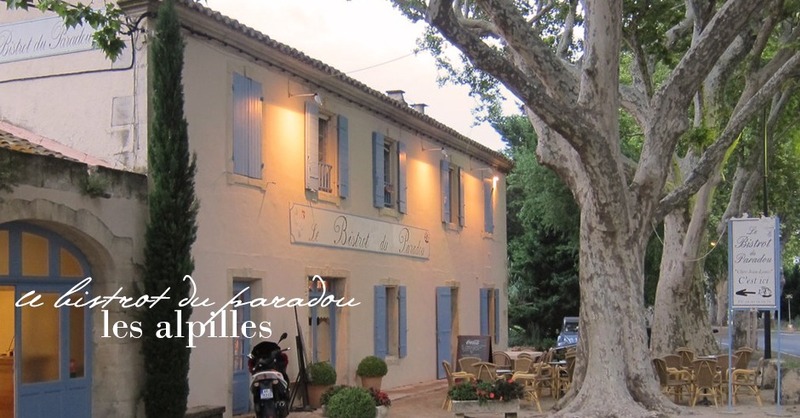 Bistrot du Paradou is the reference in the area, offering a Lyonnaise-inspired gastro-bistrot experience set in a classic Provence setting with fixed daily menu and rave reviews from tourists and locals alike. Aux Ateliers Chez Frank et Flo in Maussane-les-Alpilles, offers up a charming setting with friendly staff and delicious options for both lunch or dinner, from fresh fish to their homemade ravioli, including gluten-free and vegetarians options. Sun yourself on their outdoor terrace in the summer months, or cozy up indoors and admire their vast collection of wines from the region. Be sure to pop into the little concept store and epicerie to fill up your bike basket with Provencal goodies. Take in the latest exhibit at Les Carriere des Lumieres, but that’s not the only must-see activity. 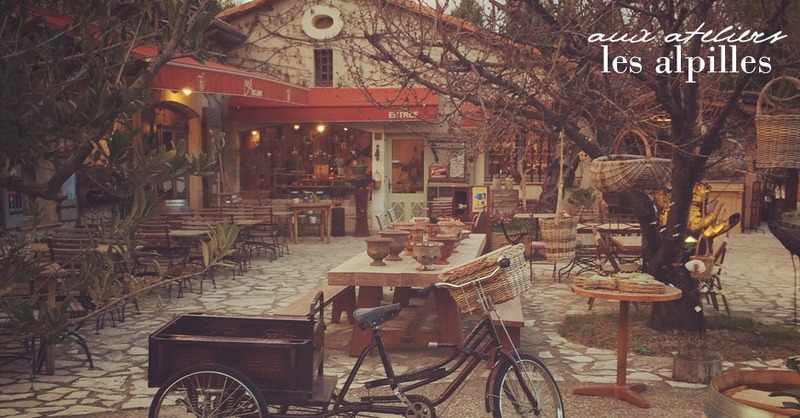 Biking tours and rustic chic picnics are the ideal way to explore this region and allow for impromtu stops to admire the beautiful scenery of olive groves, rocky outcrops and vineyards in all directions. (In the next few weeks, we will include a wine visiting guide on our blog). Laura lets us in on some great places for regional olive oil tasting and a few other places to stock your picnic baskets along the way. The Domaine Estoublon offers some of the finest olive oil in the Les Baux region. It’s a great place to visit with a variety of activities, including a fabulous epicerie to pick up some the region’s finest. 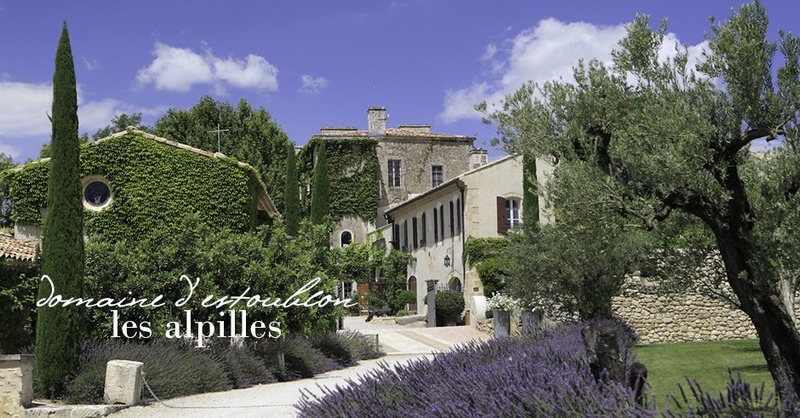 The Domaine is situated in the heart of the Alpilles, between Arles and Avignon, and is rich with Roman history. They have been producing wine and olive oil since 1731 and the property features a XVIII century château, boutique/epicerie, moulin, vineyard, chapelle, heliport and more. This property has been undergoing extensive renovations with its final phase complete shortly this spring. The Moulin du Calanquet, is a quaint, family run domaine now led by Anne and Gilles Brun of Saint-Rémy de Provence with over five generations of history. They also offer some of the finest olive oil in the area and very well-run tastings. 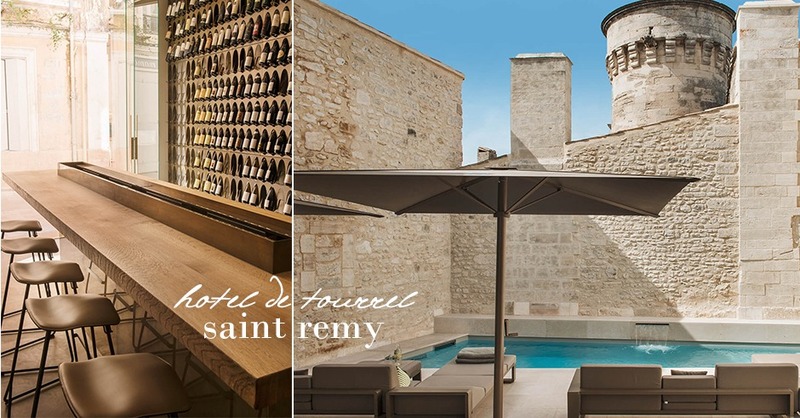 Alternatively, if you prefer to stay directly in Les Baux-de-Provence these are just two excellent, luxury choices on our list. For golf lovers, the newer Domaine de Manville hotel and spa is also receiving rave reviews for its modern yet classic feel bringing upscale Provence luxury design and modern ammenities to its guests. 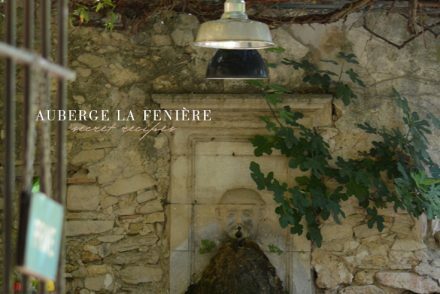 Just a stone’s throw away from the center and Les Carrieres is the rustic elegant l’Oustau Baumanière les Baux de Provence, a 5-star luxury hotel retreat offering its own gastronomic restaurant spread between five different bastides, or manoir homes. We hope we’ve offered a great weekend escape itinerary for you, whether visiting afar or living near. We will report back with more info soon. Special thanks to Laura at Unique Provence, Provence Travel and Luxury Tours.